The Delaware County Historical Society participated in Main Street Delaware’s First Friday event on June 1, with information about “ghost signs”. Ghost Signs are hand-painted advertising signs from days gone by that are still visible high up on the walls of downtown buildings. This free activity complemented Main Street’s Hidden Spaces ticketed event. DCHS prepared a self-guided tour booklet that Main Street generously printed for free distribution. Present-day photos in the booklet were courtesy of Kris Hyland Kolb, who was on hand at the Society table where visitors could see large print photos close up and optionally purchase ghost sign pictures. The booklet was distributed free of charge at the Society and the Main Street tables. Volunteers with bright green “Ask me about ghost signs” visors and matching balloons stood in the street to pass out booklets and help visitors spot and interpret the signs. 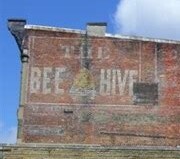 Bee Hive (Millinery/Clothing) at 4 North Sandusky Street. Thank you to our volunteers: Barb Adams, Joe Dwenger, John Foreman, Karyn Grieser, Susan Logan and Roxann Newton. Downtown Delaware First Friday was inspired by the days when families and friends would come into downtown on Friday nights for an evening out. They would take in a movie, have a hamburger at the Hamburger Inn, stop for a soda at the Dime Store and spend time with friends, making memories. Downtown Delaware is still the place to be. First Fridays include a themed event, free children’s activities and businesses stay open late. This is a family time to join your neighbors, walk the shops, eat at local restaurants and enjoy the community that Main Street has helped to rebuild. Join us downtown every First Friday 6-9pm. Main Street Delaware is a 501c3, non-profit organization and the ONLY economic development organization that advocates specifically for the downtown business district. Downtown is the living room of our community. It takes hard work to be sure it is a comfortable, welcoming place for all who pass. As an entirely volunteer run organization we clock over 4,750 volunteer hours per year. Main Street Delaware has been and continues to be the catalyst for private investments in the downtown. Working one-on-one with business and building owners to lighten the burden of government, we provide free design consultations, business trainings, and support.